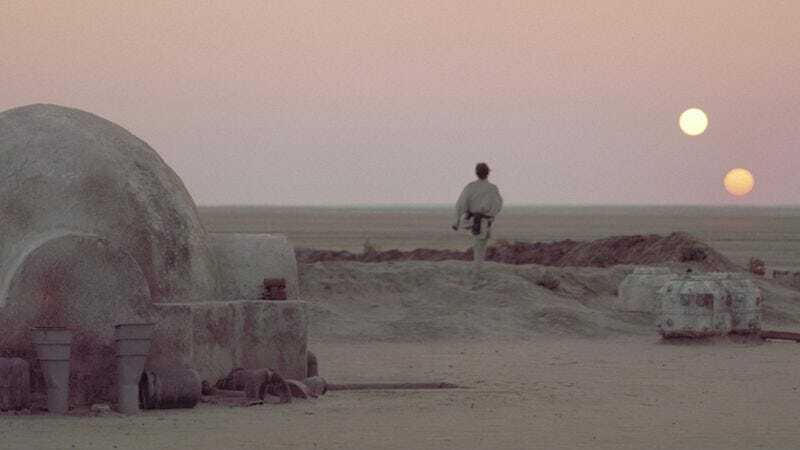 Bringing us closer to the day when we report that Star Wars: Episode VII has been confirmed to have shots of outer space, The Hollywood Reporter passes along that the production is currently building an “extensive re-creation of Tatooine” for the upcoming sequel in Morocco. Amazingly, this isn’t the first instance of such a rumor: Badass Digest reported early last week that the first day of shooting (which has already begun) was likely to take place in Morocco—possibly even skipping over to Tunisia, to make use of those abandoned, decaying Tatooine sets recently glimpsed in Rä Di Martino’s photographs, to reveal that the most desolate planet in the galaxy has somehow gotten even worse in those 30 years since Return Of The Jedi. But according to THR, this will be a new Tatooine, one that doesn’t involve putting the entire film crew in a nation currently rocked by political unrest, terrorism, and kidnapping. In a bit of ironic timing, Tunisia’s surely beleaguered tourism ministry just announced a new, international “Save Mos Espa” campaign, hoping to raise funds to help dig the home of Anakin Skywalker out of encroaching sand dunes—an operation even the ministry says would only preserve it for another eight to 10 years. If you would like to donate your money toward fighting the literal sands of time, all in order to save the house where you first learned Baby Darth Vader built C3P0, the campaign has a crowdsourcing page. You could even get your name on a plaque, which will eventually be buried under sand. As for Episode VII’s new Tatooine in Morocco, it’s obviously unclear as yet why the Star Wars characters would return, again, to the desert planet, besides the fact that they all do eventually—even when it’s an incredible coincidence, such as the fact that Jabba The Hutt just so happens to live on the same, easily set-dressed planet where Luke Skywalker grew up. This after he was placed there under the watchful eye of Obi-wan Kenobi, who decided the best place to hide him in the entire galaxy was to take him to where his father also grew up and still had family, even when there are presumably thousands of other planets with more hospitable single biomes. It’s possible Luke will finally make good on his 30-plus year journey to pick up some power converters.